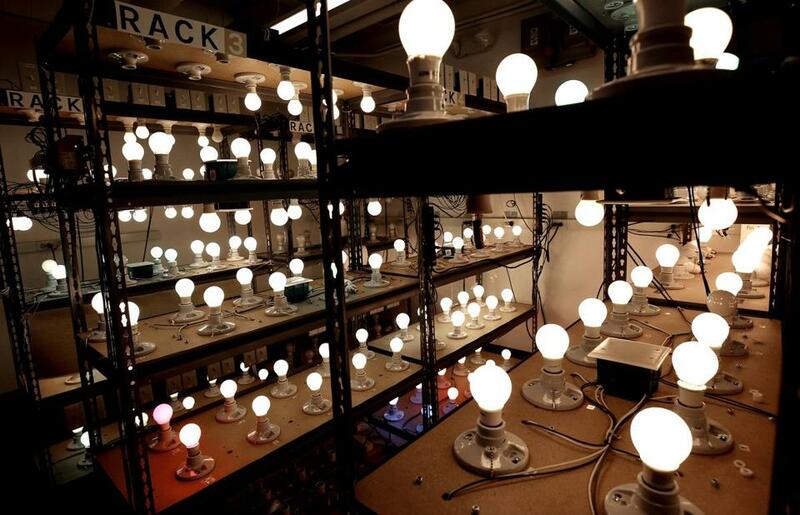 Bulbs are tested in part of the Finally Light Bulb Company’s lab in Charlestown. The firm says its bulbs are just as energy-efficient as LEDs, but easier on the eye. For a company looking to innovate within an industry, The Finally Light Bulb Company has a lab in Charlestown that is oddly reminiscent of the past. Sure, there are the usual signs of a startup: collaborative desk setups, a well-stocked snack pantry, and walls that can be written on. But make a left when you walk in and you’ll find that the company’s two conference rooms are named after great inventors from the 19th century. One is the Edison room, a nod to Thomas Edison and his invention of the lightbulb in 1879. The other honors Nikola Tesla, the engineer and inventor who worked for Edison before going on to help develop the alternating-current electrical system. Finally says it is using some of the technology Tesla pioneered to produce an electromagnetic field that combines with gas to create illumination. The result, the company says, is a bulb that is as efficient and long-lasting as the now ubiquitous LED, but easier on the eye. Similar to LEDs, the Finally bulb uses about 76 percent less electricity than an incandescent light. But that’s not the whole story, said John Goscha, the company’s founder and — until recently — chief executive. LEDs emit blue light that he says can be harsh. Finally’s bulbs include a spectrum of colors that give them a warmer glow. The company — which has 32 employees — began in Woburn in 2013, and in 2015 moved to a larger space in Charlestown, where it tests bulbs inside a “Light Engine Lab.” The product is marketed as lasting for 15 years, Goscha said, but some bulbs in the lab have been on for what would amount to 30 years of home use. Finally bulbs are available in about 1,500 retail outlets, as well through online retailers such as Amazon and Wayfair. In the past 18 months, the cost of production has come down faster than the price of LEDs, according to Goscha. But a Finally bulb still is not cheap. A six-pack — with each bulb emitting the equivalent of 60 watts — costs $31.99 , compared with about $15 for the same number of standard LED bulbs . And the company’s claims of superior light have been challenged in some quarters. Two years ago, when the bulb debuted, the consumer technology website CNET was lukewarm on Finally. “With a respectable but overstated quality of light, this bulb doesn’t shine bright enough to impress,” wrote reviewer Ry Crist . But like other lightbulb makers, the company is gearing up for 2020, when energy-eating incandescent bulbs will no longer be sold in the United States. When that day comes, Goscha believes, consumers will, uh, finally notice the difference between Finally bulbs and LEDs. Meantime, Goscha’s role at the company is changing. Earlier this month, Finally announced that Michael Simon is taking over as CEO to help the company increase sales. Goscha will remain as board chairman, focusing more on the innovation and product development side of Finally. As of this month, the company had raised $38 million in funding. Simon’s background seems unusual for a guy who’s going to run a lightbulb operation. He was a chief marketing officer at Panera Bread and at the low-calorie beverage company Bai Brands. Those experiences, he said, have given him an understanding of how to build customer loyalty and use data to figure out what customers want. Natasha Mascarenhas can be reached at natasha.mascarenhas@globe.com.